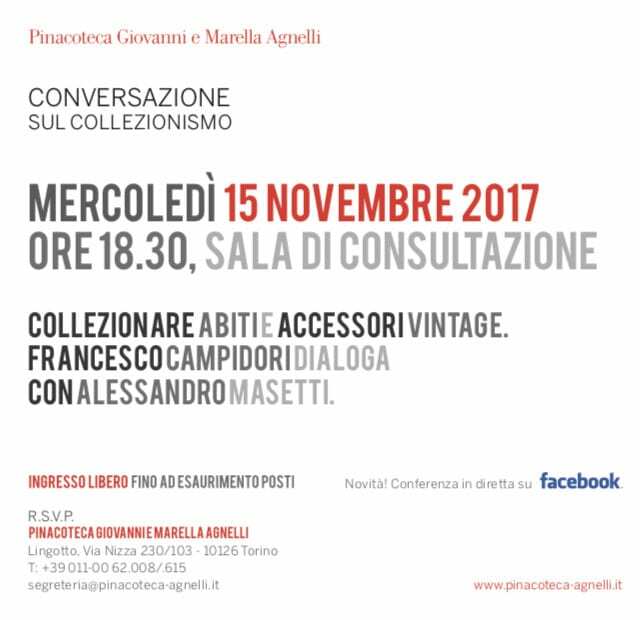 Pinacoteca Giovanni e Marella Agnelli in Turin, Italy, continues its series of conversations on collecting, hosting a meeting dedicated to fashion. The main guest is Francesco Campidori, a collector of clothes and accessories ranging from the Fifties to the Nineties of the 20th century, with a specific attention to Italian and French productions. Alessandro Masetti will talk with him. Francesco Campidori began collecting clothes and accessories in 2001, driven by his great passion for fashion. After 16 years and over 1000 pieces collected – found in flea markets or international auctions – what he loves to define “the Archive” is going to be cataloged. His collection features high fashion or ready-to-wear garments for women, men and even kids: a collection of objects of the 20th century, with particular attention to the period between the 1950s and the 1990s. Great masters like Yves Saint Laurent or Valentino share space with avant-garde talents such as Hussein Chalayan or Bernhard Willhelm or unknown designers, or forgotten ones. They are items that represent the personal taste of Campidori, sometimes talking and sometimes fighting between themselves, revealing the unexpected and the thrill of collecting fashion. In this process bibliographic research is critical to date and contextualize the items with the utmost precision – an exciting path through which retrieving a mosaic’s tessera, or extracting an object from the dispersion of time. A time imagined and dreamed thanks to all these objects collected, saved, studied and worn by Campidori. A collection that is like an emotion in becoming, an escape from mediocrity and everyday banality. The passion for clothing and fashion, and its technical aspects, flows in the blood of FRANCESCO CAMPIDORI (Fiesole, 1984) since a long time. Perhaps he inherited the sense of craft from his grandfather, who had an haberdashery and a high fashion fabric shop, and his grandmother, a seamstress. Graduated in fashion and costume at the State Art Institute of Porta Romana and at Polimoda in Florence, Campidori adds to his main work as pattern maker, a continuous studying and updating activity in the style research field and technical solutions for fashion production. This brings him to the discuss with other professionals and attend exhibitions and museums dedicated to fashion and contemporary art. At the same time, he is implementing a private fashion archive with particular attention to Italian and French productions through the continuous research of items and cataloging clothes and accessories from the 1950s to the 1990s. The archive is flanked by a huge library for which Campidori buys volumes, specialty and rare papers as well as digital documents. ALESSANDRO MASETTI (Florence, 1987) is an architect background and long-time experience in communications, fashion culture and art curation. Since 2010 he has authored TheFashionCommentator.com, and also been freelance contributor for fashion magazines on line including the encyclopedia project “Vogue Encyclo” for Vogue.it. COLLECTING VINTAGE CLOTHES AND ACCESSORIES.